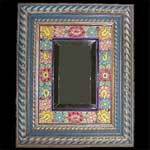 Our mirrors are hand enameled and many are accented in 24k gold. Whether small or large, these mirrors are truly eye-catching and add that perfect Spanish style to your favorite room. Our Spanish mirrors can be hung from the wall using the hangers provided. Some of the mirror may come with the hanger, but it may not be attached to the mirror to allow you to select your hanging option. We also have unique plate mirrors available that are made in the same sizes as most of our Spanish plates. Our smaller mirrors can also be displayed as a desk decoration. You can choose from our gold plate stands or standard plate stands to hold your mirror. If you need any assistance in finding the right stand for your mirror, send us an email or give us a call and we'll help you select the stand that works best for your needs.